Recently, various toppling slopes have emerged with the development of hydropower projects in the western mountainous regions of China. The slope on the right bank of the Laxiwa Hydropower Station, located on the mainstream of the Yellow River in the Qinghai Province of Northwest China, is a typical hard rock slope. Further, its deformation characteristics are different from those of common natural hard rock toppling. Because this slope is located close to the dam of the hydropower station, its deformation mechanism has a practical significance. Based on detailed geological engineering surveys, four stages of deformation have been identified using discrete element numerical software and geological engineering analysis methods, including toppling creep, initial toppling deformation, intensified toppling deformation, and current slope formation. The spatial and time-related deformation of this site also exhibited four stages, including initial toppling, toppling development, intensification of toppling, and disintegration and collapse. Subsequently, the mechanism of toppling and deformation of the bank slope were studied. The results of this study exhibit important reference value for developing the prevention-control design of toppling and for ensuring operational safety in the hydropower reservoir area. 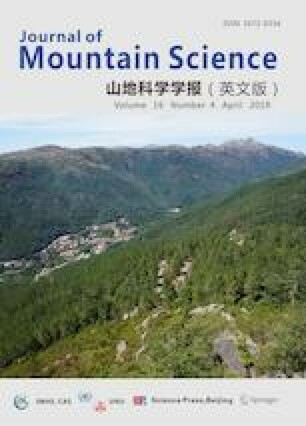 We are thankful to Professor LI Yu-sheng from the State Key Laboratory of Geohazard Prevention and Geoenvironment Protection, Chengdu University of Technology, for the fruitful discussions and comments during the preparation of this article. We would also like to thank LI Yusheng, LI Kan, WANG Jue, GUO Qian, YE Song, HUANG Yan-song, and the Northwest Engineering Corporation Limited for their support during the field investigation. Further, we appreciate the linguistic assistance provided by Enago during the preparation of this manuscript. This study is financially supported by the National Key R&D Program of China (2018YFC1504905), the Funds for Creative Research Groups of China (41521002), and the National Natural Science Foundation of China (41772317 and 41372306).